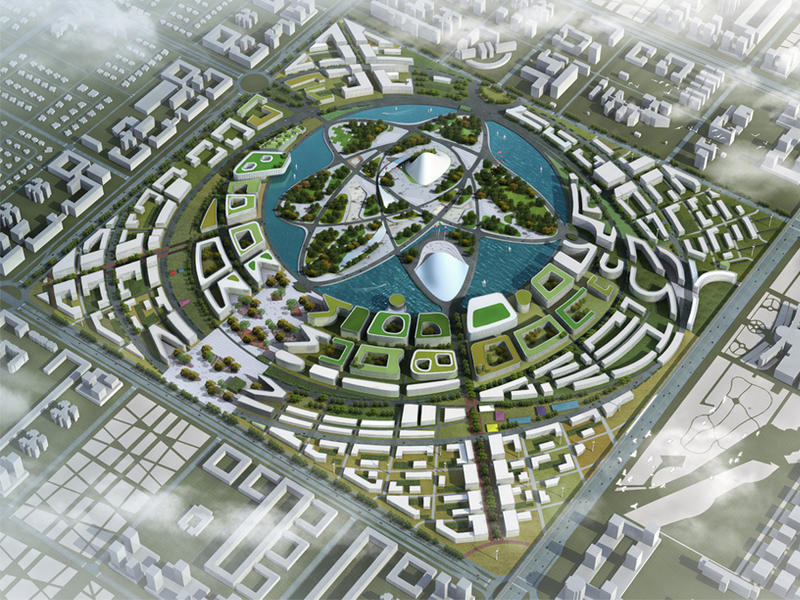 Program: Urban design and planning of Astana Expo 2017, including the exposition, parks and public gardens, outside infrastructure and landscape. This EXPO 2017 proposal responds to the context of Astana by creating a new symbol for the city that embodies the ideals of future energy. EXPO City proposes to introduce new lifestyles that embrace the green economy and pave the way towards the Third Industrial Revolution. The master plan is organized through a series of concentric circles that offer different methods of circulation throughout the neighborhoods within the site, and programmatic diversity. 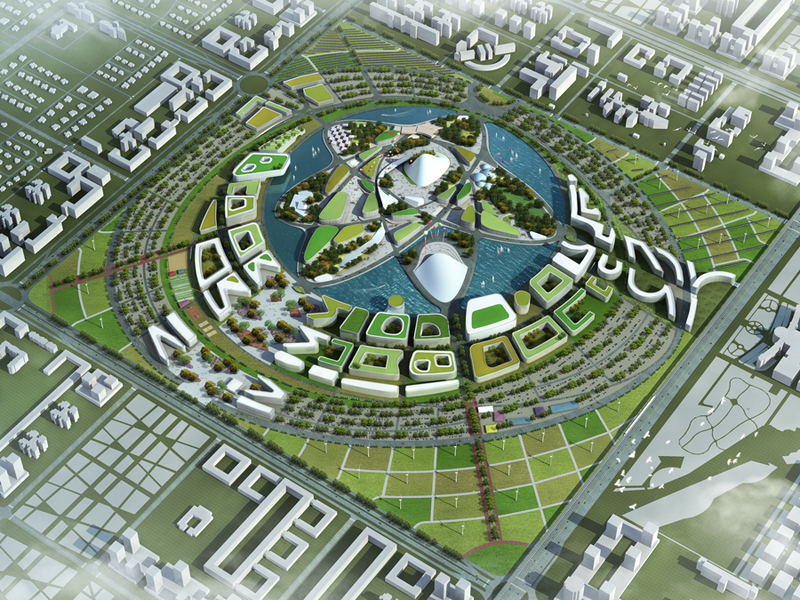 The Cultural Loop is the innermost loop, acting as the interface between the EXPO site and EXPO city. This loop consists of a promenade along EXPO Lake linking the various cultural institutions and EXPO-affiliated venues. The second loop is the Urban Loop containing EXPO City. This high-density zone features mixed-use commercial, residential, and office buildings that will continue to flourish post-EXPO. The Urban Loop contains the primary boulevard on the site that links the EXPO City to the city beyond. The third loop is the Recreational Loop containing a variety of sporting venues and fitness facilities. These include tennis and basketball courts, running and cycling tracks, soccer fields, and an equestrian course. The Recreational Loop is adjacent to the local tram network. The Community Tram Loop connects the different neighborhoods to the existing light rail system running North-South along the western edge of the site. In addition, this tram provides a localized sustainable transportation route for both residents and international visitors to the EXPO. The fifth loop is the Sustainable Living Loop that offers urban farming, community gardens, farmer’s markets as a means to create public space for local residents and to encourage ecologically-sensitive living habits to city-dwellers. The capital of Kazakhstan, Astana, is planned along major axes, with lush boulevards culminating into iconic structures. To the north end is the Baiterek, Astana’s “Tree of Life” tower; at the other end on the south is the 2017 EXPO Site. 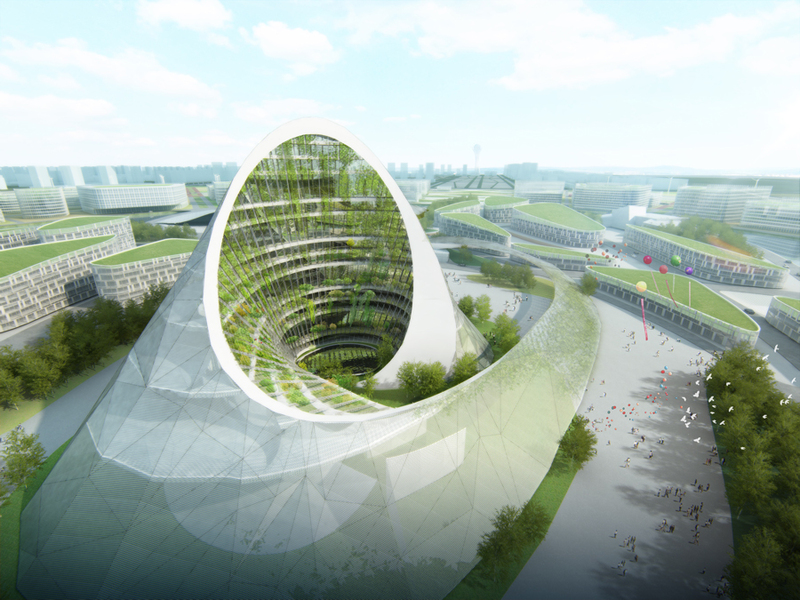 Focused on the theme of Future Energy, the EXPO symbol uses the concept of ecology and solar energy to pull the green boulevard into the EXPO complex and twists it up vertically into a towering green atrium wrapped in spiraling strips of solar panels. Approaching the site, the symbol appears as a solid mountain looming over the EXPO city. Yet as visitors begin to circumambulate through the looping curatorial paths, the interior green terraces reveal a lush courtyard growing within. The spiraling shape invites visitors to follow the ribbon into the exhibits housed inside. During the EXPO, the symbol will be the Kazakhstan Pavilion, including programs such as exhibition on future energy and on the third industrial revolution, along with restaurants, cafes, auditorium and commercial spaces. Post EXPO, the symbol will remain as a museum and archive about this great event hosted by Astana. It’s presence as an iconic symbol for Future Energy acts as a reminder for EXPO 2017 for generations to come. During the EXPO, the green courtyard serves as an educa­tional demonstration about urban plant life and ecological friendly energy sources. Angled to maximize sun exposure and shaped to col­lect rain water, the courtyard is a habitat of its own. Post EXPO, this courtyard becomes a vertical park with the public terraces to be used and valued by the citizens of Astana. Generated from the planning axes of Astana, it is intertwined with the idea of landscape pulling up to the sky, shaping a cave within a mountain. The Symbol for the Astana 2017 EXPO is a timeless icon for future energy and ecology.